The constituents in eleuthero that have been most studied are the eleutherosides.1 Seven primary eleutherosides have been identified, with most of the research attention focusing on eleutherosides B and E.2 Eleuthero also contains complex polysaccharides (complex sugar molecules).3 These constituents may play a critical role in eleuthero’s ability to support immune function. 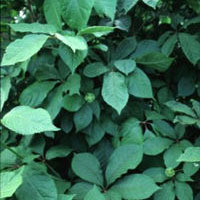 Eleuthero has been shown to be effective as a treatment for the common cold when combined with andrographis in a formula sometimes referred to as Kan Jang.13, 14 Preliminary evidence also suggests that eleuthero may prove valuable in the long-term management of various diseases of the immune system, including HIV infection and chronic fatigue syndrome. Healthy people taking 2 teaspoons (10 ml) of tincture three times daily have been shown to have increased numbers of the immune cells (T4 lymphocytes) that have been found to decrease during HIV-infection and AIDS.15 Further human clinical trials are needed to confirm that eleuthero may be helpful for this disease. Dried, powdered root and rhizomes, 2 to 3 grams per day, are commonly used.16 Alternatively, 300 to 400 mg per day of concentrated solid extract standardized on eleutherosides B and E can be used, as can alcohol-based extracts, 8 to 10 ml in two to three divided dosages. Kan Jang is a formula combining an andrographis extract with an eleuthero extract providing 2 to 2.4 mg eleutherosides daily. Historically, eleuthero is taken continuously for six to eight weeks, followed by a one- to two-week break before resuming.